PHOTO COURTESY WESTBANK PROJECTS CORP./Henriquez Partners Architects: A new on-site park is part of Westbank’s revised rezoning application. Still at the conceptual stage, it will include a dog run, water feature, and urban agriculture. A new on-site park with dog run, increased heritage conservation, and a refined built form that includes reduced streetwall heights and densities marks the major features of Westbank Projects Corp.’s revised zoning application, which the company submitted to City Planning last month. Westbank has embarked on an ambitious redevelopment of the parcel of land including Honest Ed’s and Mirvish Village that is bounded by Bloor, Bathurst, Lennox, and Markham streets. The components of the original application’s vision, however, remain constant. 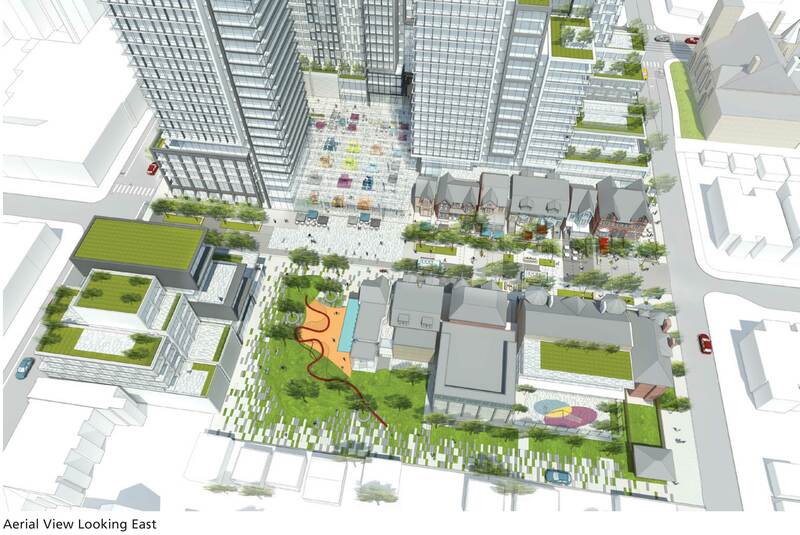 Mirvish Village will still be 100 per cent rental housing, incorporate a vibrant public realm with market and micro-retail spaces, include a daycare, promote transportation alternatives, and be built to be as environmentally sustainable as possible. “We have worked hard to revise the application to address the concerns that have been raised while keeping the overall vision for the project intact,” said Peter Venetas, project manager. He explained that the revisions reflect feedback from almost a year of community consultation meetings, design charrettes, discussion group meetings, and comments from city staff. “We flagged three areas to be addressed in a resubmission: parks, heritage, and built form,” said City of Toronto planner Graig Uens, who acknowledged that “Westbank has taken those into consideration in its revised proposal”, but reserved comment until he has had time to study the submission in detail. 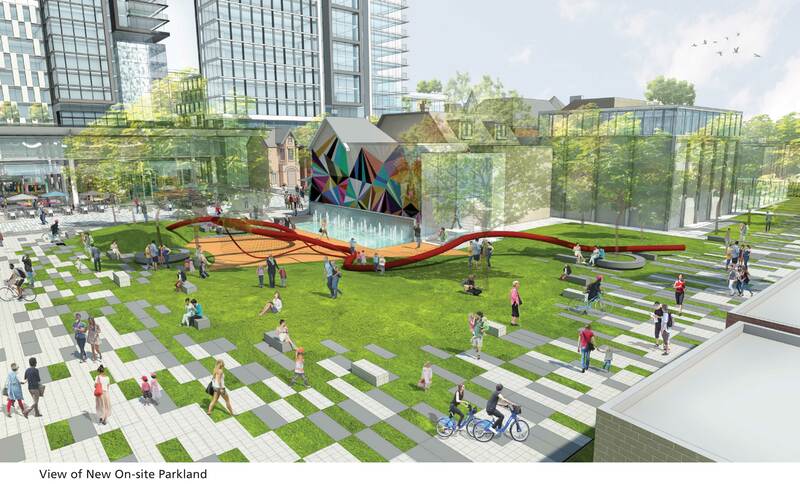 At the heart of the revised application is the inclusion of on-site parkland located on the west side of Markham Street facing the Mirvish Village Market. Venetas believes the park “will help with providing much needed parkland and transition to the stable neighbourhood, providing a buffer”. The on-site daycare has been relocated to the ground floor, and part of the park includes space for the facility’s outdoor play area. Although still in the conceptual stage, the park will be an extensive addition to the public realm that includes a dog run, a water feature, and space for urban agriculture. COURTESY WESTBANK PROJECTS CORP./Henriquez Partners Architects: The proposed park will wrap around the retained heritage houses. “The extent of the park will weave into the adjoining spaces, extend behind the heritage houses, and will be carried into the lanes by the expression of the continuous ground plane treatment,” reads the application. Heritage conservation is another hallmark of the revised proposal. In a nod to a Toronto City Council decision to list 35 properties in the Bloor-Bathurst streets area (27 of which are on the project site) on the heritage list, Westbank has proposed to increase the number of retained properties from 15 to 21. In order to accommodate the addition of a park and increased heritage conservation, Westbank has retained and shifted 610 Markham St. south and completely eliminated one mid-rise building, resulting in the removal of between 50,000 to 70,000 square feet of density. That also means the number of rental units has been reduced from 1,017 to 946. Honest Ed’s Alley will also be retained in its original configuration. Although the height of a mid-block tower on Bathurst Street has been increased from 25 storeys to 29 storeys plus a mezzanine, heights along the streetwalls generally have been lowered. He added that the revised application also breaks the property up into four elements to create more porosity throughout the development as a whole. Preserving and enhancing the public realm through on-site park land dedication, unified streetscaping, and front yard setbacks on Markham Street are part of the draft public realm policies of the Bathurst Bloor Four Corners Study, the latest version of which is set to be considered at community council on June 14. Venetas characterizes the application as being “informed” by the draft study, while Uens said that “it’s tough to determine [at this point] whether it complies with the more technical parts of the Four Corners Study, but it is something we are going to consider”. Uens added that he anticipates the city will have written comments on the revised application back to Westbank within six weeks. The city’s planning department will hold a community consultation meeting on Westbank’s revised zoning application on June 13 at the Bickford Centre from 6 to 9 p.m. The project model is also regularly on view at Markham House (610 Markham St.), where Westbank representatives are prepared to answer any questions regarding the future of Mirvish Village.